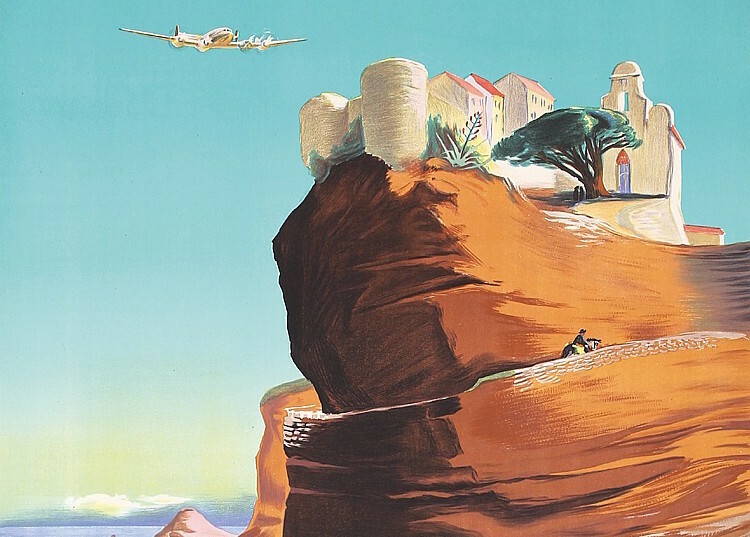 From a 1952 Air France poster advertising flights to Corsica. As France flirts with political Armageddon, my mind returns to the gentleman with whom I shared a flight in 1996. I was returning from India on an Air France flight bound for Paris. He was sitting to my right, an unshaven, tousle-haired man in his thirties who smoked incessantly and refused all food, drinking only coffee. When we landed at Charles de Gaulle, I wished him well and, at the baggage claim, stood as far away from him as I possibly could, trembling slightly in case the airport police should arrive and arrest us both. He seemed to understand and did not so much as look at me while we waited for our luggage. I waited until he had gone before leaving the airport, his shoulders hunched, his brow furrowed. We had established between us a rare if troubling intimacy on that flight, and I think of him often. If ever I find myself on the losing end of an argument, my last recourse is to thump the table and say “IT IS KNOWN” in that manner of that angry, desperate, sorrowful Corsican. As Sunday’s election nears, I wish to say this. Monsieur, if you are still with us, I am afraid you may be on the verge of making a terrible mistake fueled by your desire to prove the supremacy of French cuisine to Indians everywhere. I urge you not to, and with this in mind, I would like to offer you the following bargain. If, on Sunday, you should feel moved to photograph your ballot paper, proving you did not vote for Mme. Le Pen, I will have a T-shirt made with the following words printed boldly on the front and wear it every Sunday for the rest of my life: IT IS A KNOWN FACT THAT FRENCH FOOD IS THE BEST IN THE WORLD AND SUPERIOR TO INDIAN FOOD IN EVERY RESPECT. Rajeev Balasubramanyam is the author of In Beautiful Disguises, The Dreamer, and Starstruck, and the winner of the Clarissa Luard Prize for the best British writer under thirty-five in 2004. He writes regularly for VICE, the New Statesman, the London Review of Books, and others, and his short fiction has featured most recently in McSweeney’s, and the Missouri Review, who published the opening of his latest novel, Professor Chandra Follows His Bliss.